Who says you canât have a little room if you live on the water? This neat and clean waterfront home in Bokeeliaâs Charlotte Shores features a fenced side yard with plenty of room to stretch out. Plus much more! You will enjoy outdoor entertaining around the pool in the two-story pool cage, and you will love the large boat dock with a covered lift for your boat. This home has boat ramp privileges with membership in the HOA. Thereâs even a pergola in the back yard near the rear garage door. Getting kayaks and boating equipment in and out of the lower garage/storage area will be a breeze with the rear garage door. Inside youâll find a living and family rooms, bright airy kitchen with SS appliances and water views, and an outdoor dining area adjacent. THERE'S A LARGE (905 sq. ft.) FINISHED LOWER LEVEL WITH BONUS ROOMS AND STORAGE AREAS. 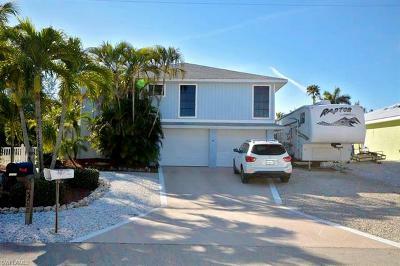 If you are looking for a comfortable home that will enable you to enjoy all the fishing, boating, and beaching that Pine Island is known for, you owe it to yourself to look at the 3-D virtual tour and make you appointment to see this soon.